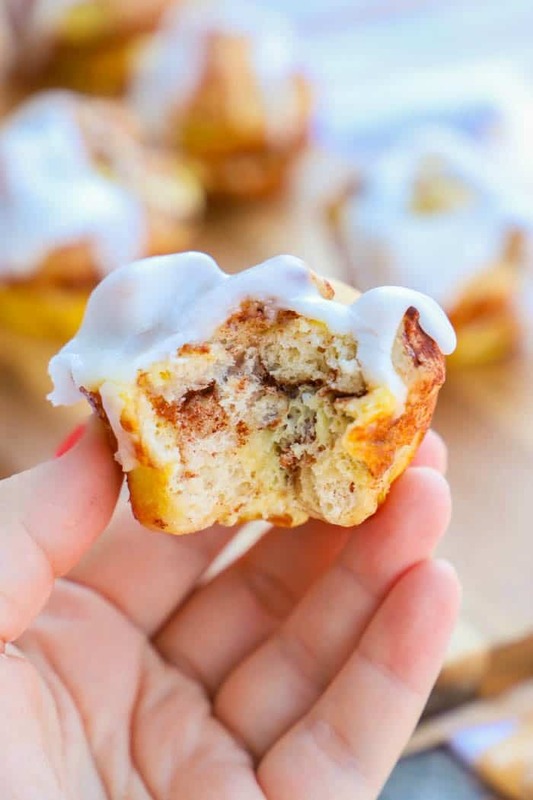 These Cinnamon Roll Muffins are so simple to make and taste amazing. They are made from refrigerated cinnamon rolls very similar to my cinnamon roll breakfast casserole. 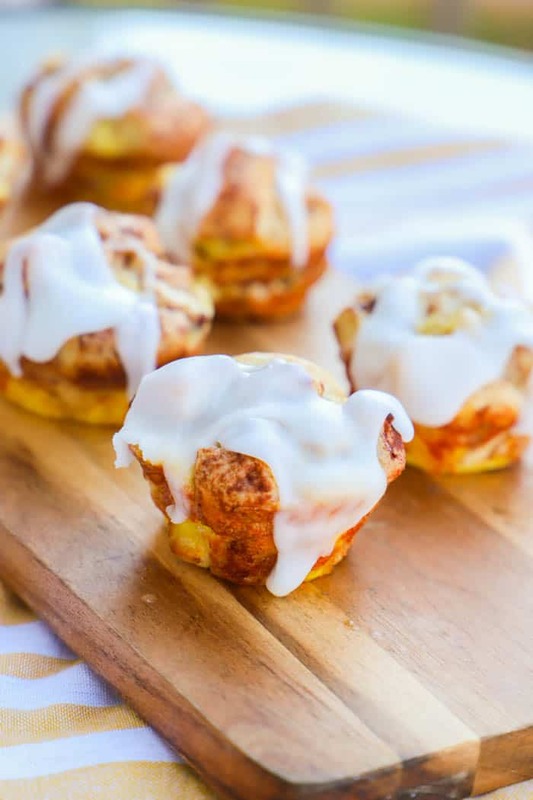 Baked with eggs and cinnamon then topped with the icing that came with your refrigerated cinnamon rolls. If you love cinnamon rolls you can also serve it as a dessert with this cinnamon roll cake. I LOVE Cinnamon Rolls! It’s one of my all-time favorite breakfast recipes when I want something sweet. 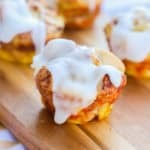 These Cinnamon Roll Muffins are so simple to make. I used a tube of refrigerated cinnamon rolls and cut them and baked them in an egg wash. It’s so simple and they taste amazing. Breakfast can be a challenge for me. I am not really a morning person but having small children you really have no other option except to become a morning person. 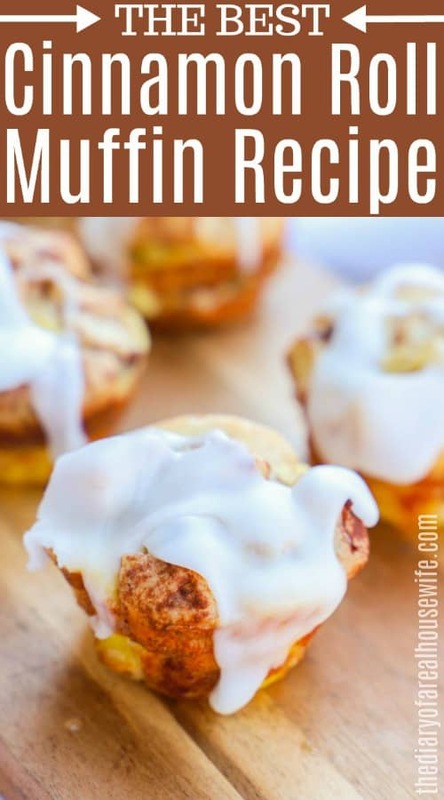 I am always on the hunt for an easy breakfast recipe and after I made my very similar cinnamon roll casserole I wondered if I would do the same thing with muffins. They came out perfectly and one of our favorite recipes. Step one: Start by preheating your oven and then prepare a muffin tin heavily with nonstick cooking spray then set aside. For this recipe, I did not use liners but you could if you want. Since I am not using liners that is why I make sure to heavily spray the muffin tin. All my muffins came out easily. Step two: Open refrigerated cinnamon rolls and cut each roll in quarters. Once they are cut then you can place these evenly into your muffin tins. This made about 16 muffins for me. Step three: In a separate bowl whisk together eggs, cream, vanilla, and cinnamon. Step four: Once whisked pour this evenly into each muffin tin about 3/4 of the way full. Bake until cooked through. Allow cooling slightly then drizzle on icing. Muffins are the best for breakfast. I love making a batch that we can eat on all week. Plus you can easily eat them on the go or pass them back to the kids on the way to school or activities. Here are a few more of my favorite muffin recipes for you to try next. Preheat your oven to 375 degrees. Prepare a muffin tin heavily with nonstick cooking spray then set aside. Open refrigerated cinnamon rolls and cut each roll in quarters. 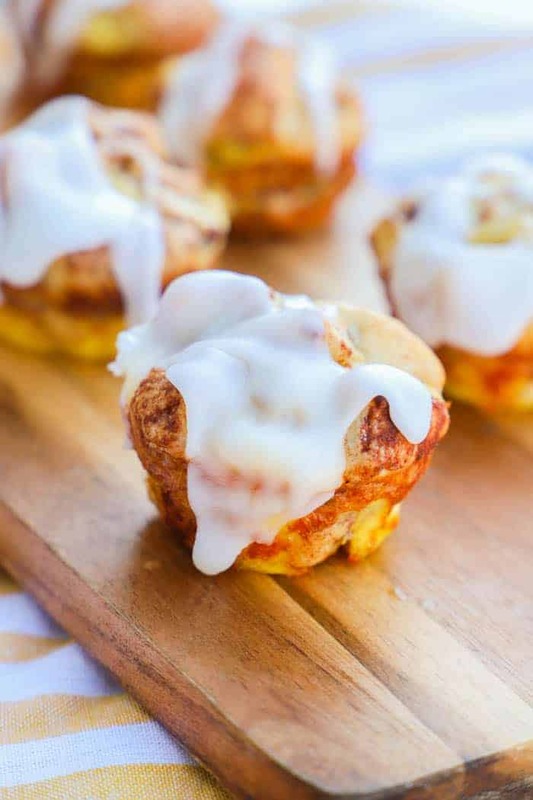 Place these evenly into your muffin tins. In a separate bowl whisk together eggs, cream, vanilla, and cinnamon. Once whisked pour this evenly into each muffin tin. Bake for 15 minutes or until cooked through. Allow cooling slightly then drizzle on icing. Yum! I’m going to have to try this out. Thanks for sharing. these look great I can’t wait to try them!!! Ooooohhhh! I’m making these for breakfast in the morning:) Looks delicious! Yum! These look wonderful and I already know that these wouldn’t last very long at our house. Pinned. Slurp. These look yummy!! I would most definitely lick the cream cheese first. My hubby would love these, Thank you so much for linking this up to The Creative Collection Link Party. Oh my gosh, do you deliver?? These look fantastic- definitely pinning for future reference. Thanks for linking up at Snickerdoodle Sunday- come back again next week!